My interest in global health was stimulated during my undergraduate years when I travelled back to my birth country to work with my cousin in health clinics in the Kibera slums of Nairobi, Kenya. This experience is what motivated me to travel to northern Haiti with Hands Up for Haiti, as part of the global health program at Goryeb Children’s Hospital. 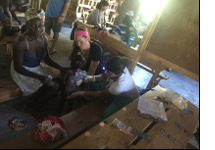 We held pediatric and adult outreach clinics in several remote villages and in the Shada slums, one of the most impoverished areas of Cap Haitien. I saw a wide variety of cases, anywhere from children with malnourishment to adults with hypertension, who did not have the money or facilities for easy access to treatment. I was deeply concerned by the lack of emphasis on preventive healthcare measures that could easily be implemented in a cost-effective manner in a country such as Haiti. Through my experience, I learned that to improve sustainability and the quality of health care in developing countries, prevention and early disease identification is essential. When we conducted sexual education lectures for the adolescent population in Bod Be Limbe, we witnessed how little they knew about preventing pregnancy and sexually transmitted diseases. These children, some of whom are lucky enough to go to school, are not taught about sexual education. Hence, this led me and other residents to develop a quality improvement project on increasing the knowledge of safe sexual practices among the adolescent population in Haiti. We are currently creating educational materials to use on future trips and working closely with the local doctors to implement these teachings in their practice. Witnessing the minimal health resources and ongoing need for preventive medicine in Haiti makes me want to continue to devote a part of my medical career to children with limited access to healthcare.